These walnut rugelach, from Ottolenghi, are made with cream cheese dough and filled with a mixture of walnuts, sugar, cinnamon, and the secret ingredient: quince paste. Sprinkled on top is turbinado sugar. 1. In a food processor, combine the flour, salt, baking powder, lemon zest, and vanilla seeds and pulse for about 15 seconds to combine. Add the butter and pulse for a few seconds more, until the mixture has the texture of fresh bread crumbs. Add the cream cheese and process just until the dough comes together in a ball around the blade, 20 to 30 seconds. Be careful not to overprocess or the pastry will be tough. Tip the dough onto a lightly floured work surface and knead for a few seconds, just to bring it together. 2. Divide the dough into 2 portions, cover each half loosely in plastic wrap, and then gently press to flatten into disks. Place in the fridge for 1 hour. 3. Preheat the oven to 350°F (180°C). Line 2 baking sheets with parchment paper. 4. Spread the walnuts on a rimmed baking sheet and toast until fragrant, 5 to 10 minutes. Remove from the oven and transfer to a plate to cool. Finely chop and place in a small bowl with the brown sugar and cinnamon. Mix together. 6. Take one of the pieces of dough from the fridge and roll out on a lightly floured work surface to form a 9 1/2-inch (24-cm) circle, about 1/8 inch (3 mm) thick. Use a small spatula or the back of a spoon to spread half of the quince paste evenly over the surface and then sprinkle with half of the sugar-nut mixture. 7. Using a sharp knife or a pizza wheel, if you have one, cut the dough as though you are slicing a cake into twelve equal triangles. The best way to get even-sized triangles is to cut it first into quarters, then each quarter into thirds. One at a time, roll each wedge quite tightly, starting from the wide outside edge and working toward the point of the triangle, so that the filling is enclosed. Place them on the lined baking sheets, seam side down, spaced about 1 inch (3 cm) apart. 8. Repeat the rolling process with the remaining disk of dough and filling, then chill the rugelachs in the fridge for 30 minutes before baking. 9. Increase the oven temperature to 400°F (200°C). 10. When ready to bake, lightly brush the tops of the rugelachs with the beaten egg and sprinkle with the demerara sugar. Bake for 20 to 25 minutes, rotating the sheets halfway through, until golden brown all over. Don’t worry if some of the filling oozes out; this will add a lovely toffee taste to the edges of the cookies. Remove from the oven and allow to rest on the sheets for 5 minutes before transferring to a wire rack to cool completely. Walnut Rugelach Recipe © 2017 Yotam Ottolenghi. Photo © 2017 Peden + Munk. All rights reserved. All recipes and photos used with permission of the publisher. There is one word for this walnut rugelach—extraordinary. When I was a child, my grandma would use extra pie dough around the holidays and create something similar to this. So when I saw this recipe I had to give it a shot. I must say, these were spectacular and tasted just like home. I would highly recommend this recipe to anyone, especially around the holidays. Oh, rugelach! This recipe makes a beautifully tender, buttery dough with a delicious quince and walnut filling. I will be making this recipe again and again. And I can't wait to experiment with other fillings, too. I don't think I'll ever buy a store-bought rugelach ever again. These lemony, flaky, slightly sticky rugelach are a perfect combination of sweet filling and not-so-sweet pastry and the dough was so easy to make in the food processor. I have always been a little afraid to try to make rugelach, however, this recipe proved that I've been missing out. These baked a bit more quickly than I anticipated, so I advise that you keep an eye on them. 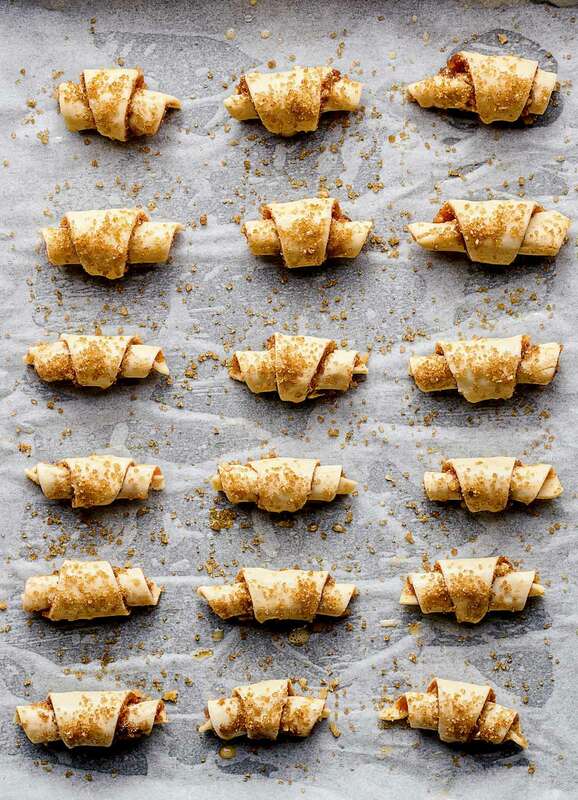 These quince and walnut rugelach are perfect for holiday gift giving and could be adapted using different types of jam and spices. 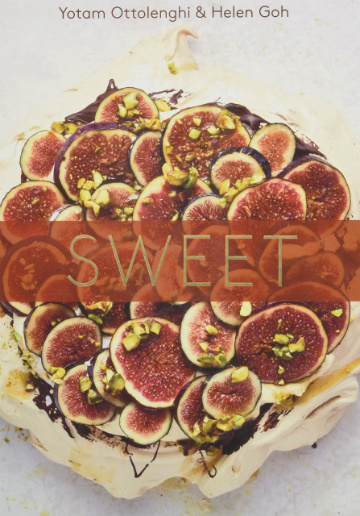 Rugelach can be a bit time-consuming, but I found this recipe to be easy to follow and manageable when broken up in chunks of time. The pastry for these walnut rugelach came together very nicely, only requiring a small amount of kneading. The coarse sugar gave a nice crunch and attractive appearance to the pastries. The recipe made 24 cookies which my husband devoured for breakfast. Thanks so much for your kind words, Natalie! Yes, they are delicious and yes, so easy! Wait’ll you taste them! I make Rugelach every Xmas using Barefoot Contessa’s recipe which is similar to this one. Instead of quince paste I use orange marmalade. I’m going to try this recipe this year also with marmalade. Sounds lovely, Martha. Let us know what you think, please and many thanks!